Graph search is powerful because you'll now be able to search through texts of posts, as we'll as peoples personal employment history, and likes. It's sure to help out with things like employment searches, and background checks. Check out Graph Search now. Scroll down that page and you'll see a link to Try a Search. If you're logged in to Facebook, this will show a result with your actual data. Once you're logged in, you'll see a button at the bottom of the page that says Join Waiting List. You'll see a message that says "Thanks for signing up for our beta. 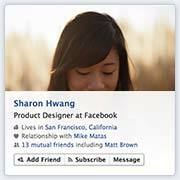 When Graph Search is ready you'll see an announcement on Facebook and you can switch to the new experience." Enjoy.